606 customers have given this product a 5-star rating. Of these, 551 customers have written no texts or given their feedback in another language. 197 customers have given this product a 4-star rating. I used these to reduce the reverb of high frequencies in my room. If you have been reading around on the internet, you should know that these things are only good for high frequencies. In that regard they work great. Placed on the walls at ear level and above. The room is a lot more pleasant to work in. A side note: playing and singing in the room definitely sounds and feels a lot better with just these installed. Tip: You can place them on the wall using double sided tape, cardboard and strong glue. Use the cardboard from the box. Cut 4 small squares for the 4 corners of each panel. Glue those onto the foam. Then put double sided tape on the cardboard corners and just stick em to your walls. I've bougth these to dampen the reflection in my home studio and the result is fantastic. The room is significantly dryer than it was. To me price is great for the results you get. I don't see how I will get any more dampening from a more expensive product. The quality of the wedges are great. 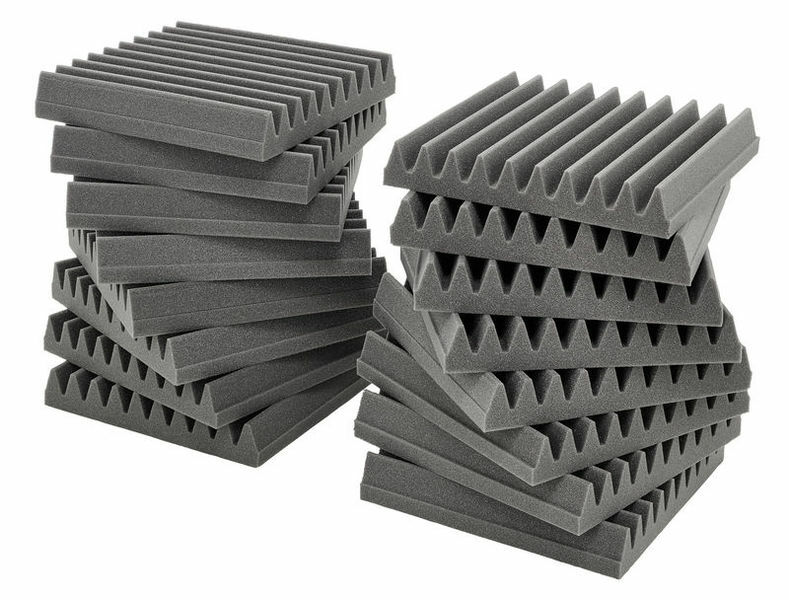 Its made up out of audio foam and is cut to precision. Some people have complained about the faint chemical smell of the product when you first unpack it. To me I've not found that to be true. I suppose it might depend on the amount of air flow in your room. And in that case just make sure you unpack it and let it stand for a week. But I've not had any issue with that. These foam tiles does all that I need it to do. And if the room is still too reflective I just add more tiles to it. But I have found that with these tiles I can deaden the room completely if I choose to. And so you can control the amount of reflection by just controlling how much of the tiles you add to your space. Also its advisable to get proper tile glue to fix these to your walls. Because double sided tape does not stick well to the foam. ID: 298705 © 1996–2019 Thomann GmbH Thomann loves you, because you rock!